This model will not run in COR, because it requires DAE solving techniques found in PCEnv. However, at present it will not run in PCEnv due to the addition of the modulus operator in the driver function, but this is a problem with PCEnv and not the model itself. The units are consistent throughout. Abstract: Cardiovascular disease claims more lives than any other disease in westernised countries, affecting millions. Pinpointing cardiovascular system dysfunction is often difficult because the clinical signs, or the availability and interpretation of physiological measurements, are unreliable. Often patient-specific information is incomplete or confusing, as it comes from a diverse range of sources, such as invasive and non-invasive pressure measurements, flow rates and electrocardiogram signals. Health professionals therefore rely on intuition and experience to make a "clinical" diagnosis and decide treatment. Sometimes this approach results in multiple therapies being applied until a suitable treatment is found. Poor outcomes result from failure to quickly and correctly diagnose and treat the underlying condition. 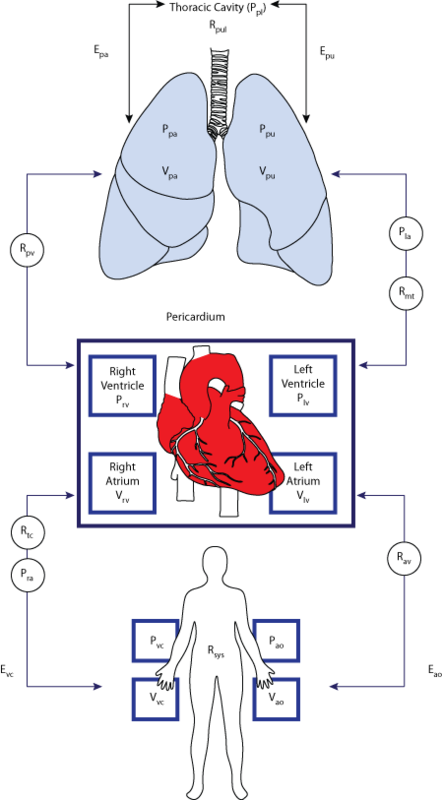 We introduce the concept of using full circulatory and cardiovascular models to aggregate the large number of diverse signals facing clinicians into a clear physiological picture of haemodynamic status. We briefly review the field, still in its infancy, of such models, focusing primarily on the basic approaches taken in the literature. Finally, we present one of the more advanced and best validated models, including initial results of animal validation studies. The overall approach is shown to have significant potential to provide clear, measured insight to replace often misled intuition in the monitoring, diagnosis and treatment of circulatory dysfunction in critical care. In the future, models and modern sensors will increasingly "invade" the critical care environment, and will provide the opportunity for better, more consistent care at the bedside in real time. Schematic diagram of the minimal closed loop model of the cardiovascular system. Derived from workspace Shaw, Chase, Starfinger, Smith, Hann, Desaive, Ghuysen, 2007 at changeset 34beaab48984.